Your foyer is the first thing that people see when they walk through your front door. If you're looking to make an impression consider some of these creative entryway flooring ideas using tile or hardwood found at Indianapolis flooring store, Kermans. Why tile or wood flooring for your entryway? Both are durable, natural materials that make a statement. Both are also easy to keep clean. Tile and wood floors go with many decor styles, flow easily into other flooring in the house and have the flexibility to really make a statement. Learn more about the types of hardwood and laminate wood flooring available at Kermans. Discover the different types of tile flooring that you'll find at Kermans. A patterned wood floor - perhaps a light and dark checkerboard using maple and walnut hardwood. A large scale mosaic tile pattern. Patterned wood inlays can create a border around the foyer. Darker wood inlays can be used in the center of a lighter wood floor to create the impression of an area rug. Large, 15 inch or bigger, square tiles set in a diamond pattern. This works particularly well with slate or stone tiles. Mix in mosaics of smaller glass tiles to form a grid with larger stone or ceramic tiles. 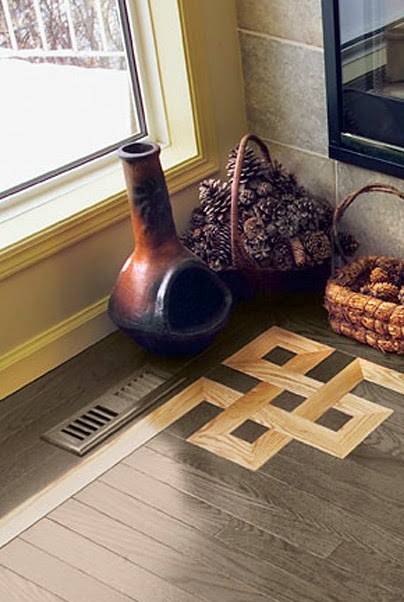 Combine both wood and tile - an inlay of tile can give the impression of an area rug in the middle of a wood floor. This works particularly well in a rectangular entryway. The expert design consultants at Kermans are ready to make your creative idea a reality - or help you come with something that is the perfect fit for your home! It's part of the everyday customer service you'll experience when you walk into Kermans. We are customer-focused and proud to offer Indianapolis homeowners affordable tile and hardwood flooring options. Learn more about the Kermans Advantage. Your best resource for tile and hardwood flooring in Indianapolis is Kermans. Stop by our showroom on the northside of Indianapolis and experience the difference shopping with a local, family-run company can make for your family.